An article earlier this month by Science Correspondent Ian Johnston on independent.co.uk - Some Neanderthals were vegetarians who used natural forms of penicillin and aspirin as medicine - reported on research revealing that Neanderthals possessed a good knowledge of medicinal plants. A Neanderthal model on display at the Natural History Museum in London. Image: Natural History Museum. 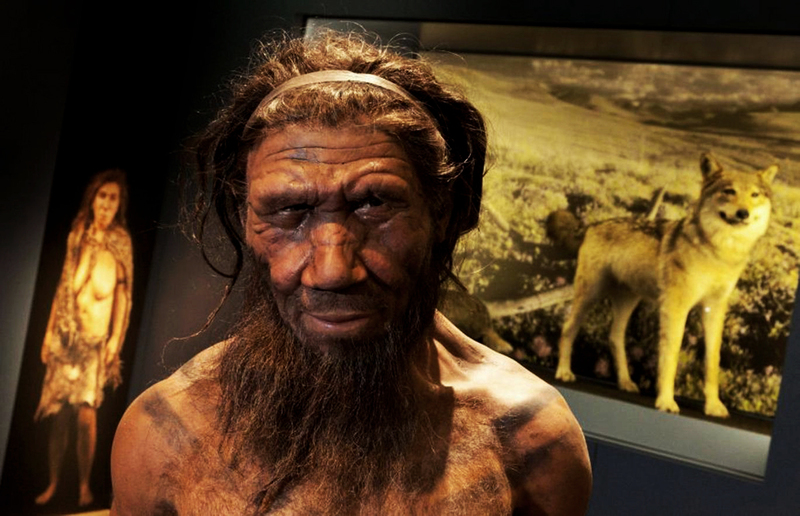 As research continues to dispel earlier stereotypes, we now learn that Neanderthals ate a largely vegetarian diet and appear to have used natural forms of penicillin and aspirin to treat infections and pain. This is based on dental plaque found on the fossilised teeth of Neanderthals who lived in what is now Asturias, Spain, and in Belgium up to 50,000 years ago. A team of researchers from Spain, Australia and the UK were able to extract DNA from the plaque that allowed them to tell what the individuals had eaten. Not only a continental diet; the 'Panel of Hands', El Castillo Cave in northern Spain showing red disks and hand stencils made by blowing or spitting paint onto the wall. A date from a calcium carbonate layer covering one of the red disks has revealed that the painting is more than 41,000 years old, making it the oldest known definitively-dated cave art in Europe. The image of the bison was painted by other Prehistoric people long after the hand images had been created. Image: Pedro Saura. Dental analysis of the remains found in Belgium revealed DNA from woolly rhinoceroses and wild sheep, along with a few mushrooms. But the teeth of the Spanish group revealed they had eaten wild mushrooms, pine nuts and moss, with no evidence of meat. The results were surprising; a varied diet including a wide range of plants, some of which may well have been cooked before being eaten. Moreover, the dental evidence points towards self-medication. The researchers discovered that the plaque preserved in one case contained sequences of the pathogen Enterocytozoon bieneusi, which causes gastrointestinal problems. Additionally, a hole in the jaw suggested that there would have been a dental abscess; intense pain. The plaque contained traces of the penicillium fungus, the natural antibiotic from which the drug penicillin is derived, and also poplar. That tree's bark, roots and leaves all contain salicylic acid, which is used in aspirin and other painkillers. The research suggests that Neanderthals possessed a good knowledge of medicinal plants and their various anti-inflammatory and pain-relieving properties, for the purpose of self-medicating. Research at El Sidrón cave in Piloña, northern Spain, has revealed that Neanderthals were taking camomile and yarrow to help their digestion.